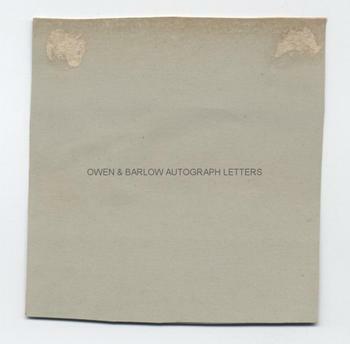 HARRIET BEECHER STOWE Autograph LETTER Signed. American author and abolitionist. Her book Uncle Tom's Cabin was influential in the anti-slavery movement and became a classic of Americal literature. ALS. 1p. Andover. March 25th [no year]. To Madame Coulon. 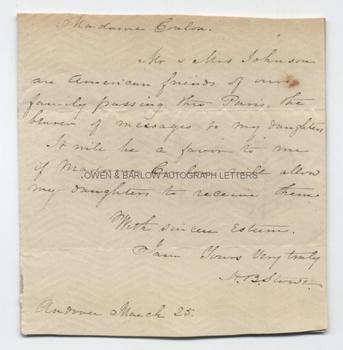 "Mr and Mrs Johnson are American friends of our family passing thro Paris, the bearer of messages to my Daughters. It will be a favour to me if Madame Coulon will allow my Daughters to receive them. With sincere esteem, I am yours, very truly, H.B. Stowe." 16mo. Approx 4 x 4 inches. Trimmed at edges and laid down by central section onto card backing with mounting traces on verso. Harriet and Calvin Stowe, both fervent abolitionists, had seven children, including twin daughters, Eliza and Harriet junior (known as Hattie). The Stowes moved to 'The Cabin' in Andover, Massachusetts in 1853, when Calvin was appointed professor of theology at Andover Theological Seminary. This was the year that Harriet Beecher Stowe wrote 'The Key to Uncle Tom's Cabin". At that date, the twins were aged 17. Sometime after the Civil War broke out in 1861, they moved to Hartford, Connecticut. The twins had enrolled at Madame Coulon's Protestant Boarding School in Paris during the family's first trip abroad. They remained there for two years after Calvin had returned home and Harriet Beecher Stowe continued a tour of Italy and England before returning to Andover in 1857. The date of the letter is, therefore, probably March 25th 1857 or 1858.